When I first started experiencing our strange customs I often looked down upon revivals and rarely visited them , this was clearly a stupid mistake as firstly I missed a number of interesting customs and secondly often these revived. The Gate to Southwell (Gate from old English for ‘way’) is one of these, a modern construct based on an account of 1530 which referred to Morris Dancers, and such the revival is solely run by the local team. What is known of the custom? It is believed to have started in 1109, when a Thomas Beverley Archbishop of York who owned lands in Nottinghamshire including Southwell, asked parish churches to make a contribution to the building of their mother church therefore ending the debate on where money collected in the county should go Nottingham or York. 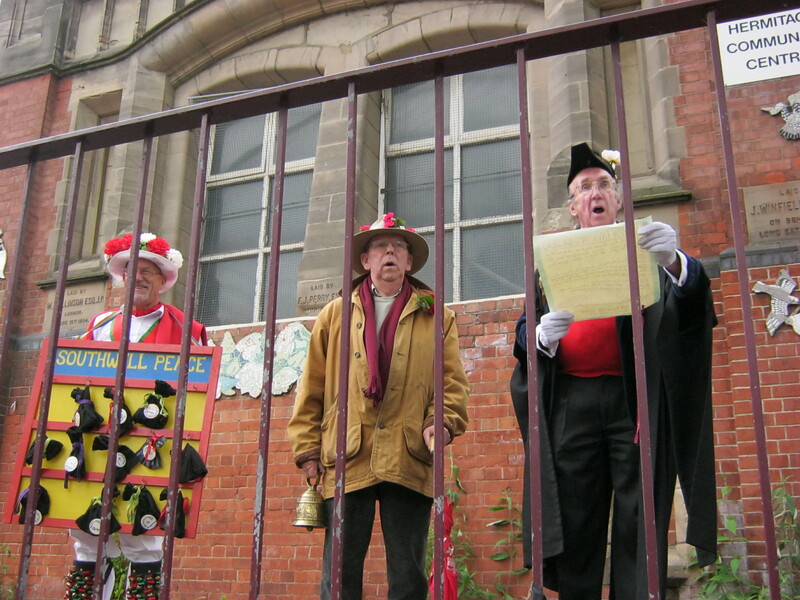 Such that it appears that at Whitsuntide or more appropriately Whit Monday, a procession was established which was attended by the Mayor and Corporation of Nottingham, the priests and churchwardens from each parish in the county bringing their Pentecostal offering to the cathedral. They would be joined by townspeople and villagers. 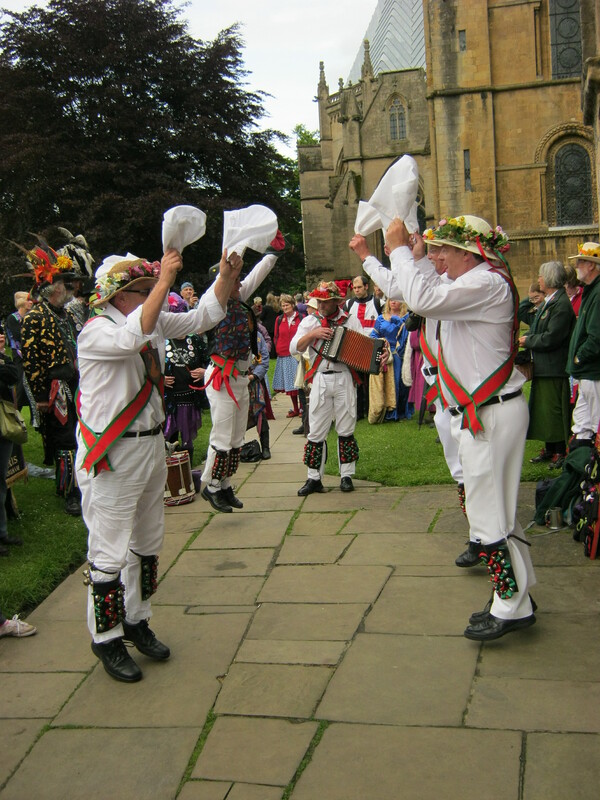 It is believed that the entertainment was provided by Morris Dancers. As suggested by that 1530 Nottingham Chamberlain’s accounts show a payment for bells, coats and ale for the Morris Dancers who took part in the Gate to Southwell. The procession upon reaching the town deliver the tribute would consist of what was called the Southwell Pence. This was collected from various parishes, ranging from Nottingham, for example, gave 13 Shillings and 4 Pence (about 66p), whereas lowly Stanton gave only 5d (about 2p). In today’s money, just under 16 quid..The colourful but supposedly solemn procession probably ended at the Reformation although it is not recorded when exactly. Interestingly, it is said that the only survival from this procession is said to be the Southwell races remembering the donkey races undertaken at Rolleston. Of course just having the Morris do the procession would be pointless without a beginning and end and as such Nottingham’s Lord Mayor is involved giving a small speech of welcome and good wishes as he hands over the city’s contributions at around 9.30 on the Sunday in the second weekend of June usually. I first experienced the Gate to Southwell in 2002, so in 2012, 10 years on I thought it time I revisited it and its heartening to say that it was still in rude health and little had changed. Nottingham’s market square was yet again thronging with the garishly coloured. The colours ranging from the more conservative whites of the organisers, the Dolphin Morris to that would be described as post-Rave Morris (a mixture of a sort of Goth, with eyeliner and coloured hair and a Day-Glo take on the paper boy). This final garb is perhaps the future of Morris, being the younger persons take on the tradition! 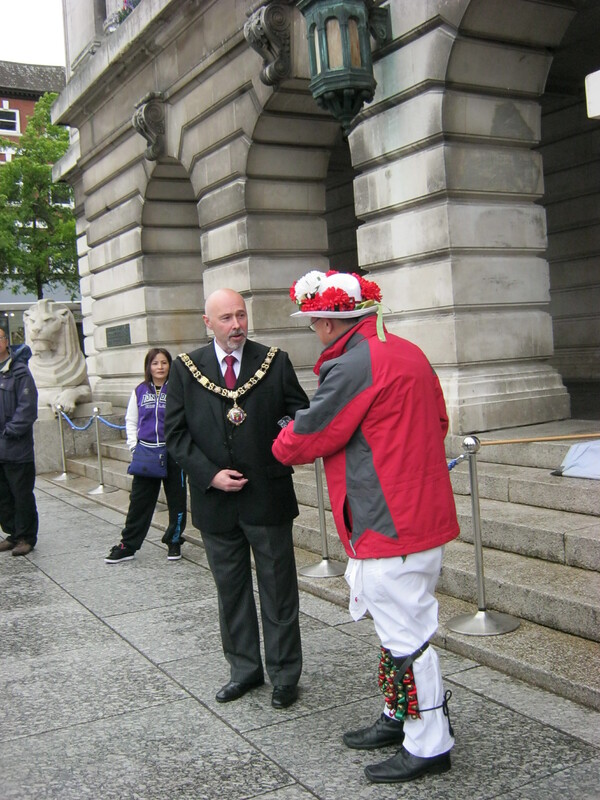 In 2012 the Lord Mayor dutifully gave his dues and the Dolphin Morris’s leader related about the days when the attendees were given free alcohol and seeing that the attending crowd were locals, took an vote. Although there is no record of the processional route, but as the villagers of Lambley, Lowdham, Caythorpe, Hoveringham, Thurgarton, Goverton, Bleasby and Fiskerton were involved presumably each of these were visited in order or rather their parishes passed through as the road to Southwell from Nottingham would have touched upon their land.. Today the procession does not of course process the whole distance but take to mini-buses stopping at pubs on the way where dancing is undertaken. Finally at around 6pm the procession reaches the Minster and hand over the pence in the board. In 2012 I rejoined them at Southwell Minster , around 5.30ish and after waiting for a few minutes the procession moved into to view filling the previously empty grounds of the church. After a rather longer than usual wait when Dolphin Morris entertained us with some impromptu signing and a violin solo with dancing. Then out emerged the Bishop and his clergy to receive their pence and so bag by bag, the leader of the Dolphin Morris invited the different teams which had association with the towns and villages from whence the money came from to place the money in the large wooden collecting bowl held by one of the clergy. .
After giving their pence, which of course is in old money, a cheque to the same amount was given over. Then the dean invited the audience in for a short service. 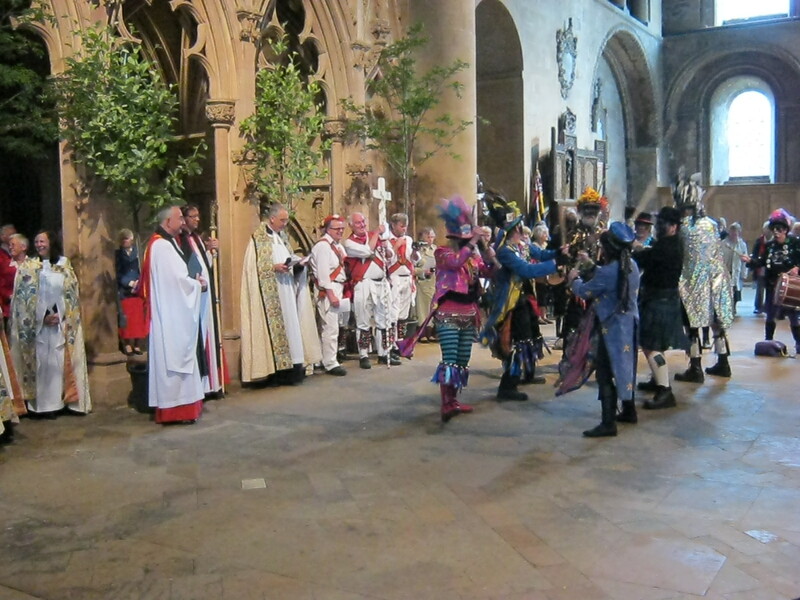 So the strangely dressed assembly (the clergy) invited the other strangely dressed assembly (the Morris!!) for a brief service which included a Morris dance in the transect and unsurprisingly Lord of the Dance. All in all The Gate to Southwell, whose popularity has spawned an even better known Folk festival in the Town under the same name, is an enjoyable revival and one which as it enters its 3rd decade looks unlikely to die out!